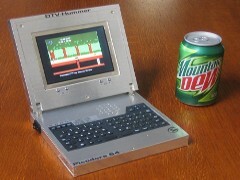 The C64p is a laptop version of the C64DTV. The system is built inside a donor laptop. The features are: new 7" TFT screen, SD2IEC, keyboard interface and 3 custom PCB's for charging the battery, audio amplifier, joystick and mouse. The production is very limited, visit the web page for more details. Peter Wendrich made a new core for the C-One. The core is based on the beta9 firmware release of Chameleon. With this core the C-One is an C64 with a turbo mode (F11). The SID is emulated with filters (stereo SID is optional), and all VGA resolutions are available. Outtakes is a new demo for the Commodore C64 DTV. The demo reached the fifth place in the Mixed Demo Competition at Nordlicht 2013. The demo was programmed by Benson and Peiselulli, the graphics are from CONS and mis, the music is from dEVILOCK and Henne and the loader is from tlr. In the demo you can see the story of Romeo and Juliet, and Spike ?!?! Linus Åkesson made a demo for the extender board of the C-One. The C-One is a FPGA computer developed by Jeri Ellsworth and Jens Schönfeld. 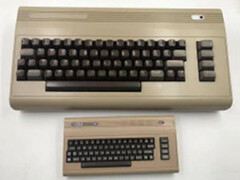 The C-One is a modern version of the Commodore C64. For the demo Linus developed a new FPGA core with a new CPU, FM synthesizer and blitter with pixel shader support. The demo won the wild compo at Revision 2012. Egretz is building a modified C64 DTV. He is designing a expansion that can be placed on top of the original C64 DTV without soldering. 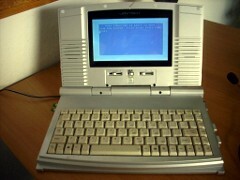 The features are: Joystick 1 and 2, PS/2 (keyboard), Video, Audio, IEC, SD memory card and a IDE connection (hard disk). For the extra functions he uses a Atmega micro processor. Jeri Ellsworth released a video on YouTube. In this video you can see a old project of Jeri from 2005. 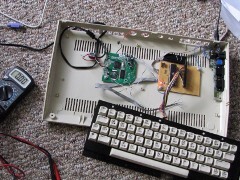 This project was the successor of the C64-DTV. The Amiga version needed more Flash memory, and the toy company lost interest because it would be more expensive. Later the market for this kind of toys collapsed. Alessandro Dorigatti has made a ZX Spectrum (48k PAL) core for the C-One with FPGA extender. The core supports the ULA+ 64 color mode, a Kempston joystick emulation and can load TAP files. This core requires a monitor that supports 50Hz. 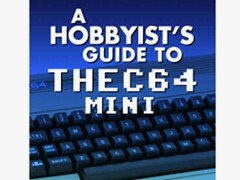 An English manual and a keyboard layout is included. 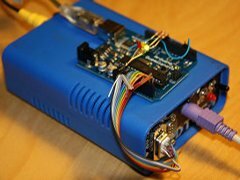 Chris (Lallafa) has build a new version of the dtv2ser device. With this device you can transfer data to and from the C64 DTV via a USB connection. The new version is build with the Arduino platform and needs only a very small hardware modification. You can read all the details on Lallafa's blog. Falcon soft released a new puzzle game for the Commodore C64 named Rubicon. The game was made by Hamar (code) and Mitchell (Graphics). The game is based on the world famous Rubik's Cube and can be played with the joystick. Peter Wendrich released a preview of the Chameleon core for C-One. A 1351 mouse emulation is provided when using a ps/2 mouse. The numeric keypad on the keyboard functions as joystick (2,4,6 and 8 for direction, 0 is fire). As the SID is completely emulated, paddles and real 1351 mice won't work with this core. For the C-One is a new Minimig core (v2.0) available. Tobias Gubener ported Jakub Bednarski's sources of September 2009 to the C-One. The features include: Emulation of four floppy drives (DF0: to DF3:), Emulation of two hard drives (4GB), FAT16 or FAT32 supported for the CF memory card, Long file names for ADF images allowed. Memory 11.5MB: 2MB chipmem, 1.5MB slowmem, 8MB fastmem. For this core you will need a C-One with FPGA extender. Misery is a demo for the C64 DTV. This demo is made by the group TRSI. The demo is for the C64-DTV, but can also be viewed with the VICE emulator, on YouTube or you can download the video. Coding: Benson, Peiselulli, Street Tuff. Music: Jammer. Graphics: Benson, H2o, Peiselulli, Street Tuff, ZerO-X. Loader: tlr. 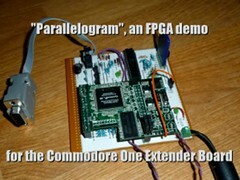 Peter Wendrich has compiled a new FPGA-64 version. It has swapped joystick ports and has a workaround that fixes the X/Y pot swap on the C-One PCB. Just as with the latest Chameleon core, with this release 1351 type mouse or paddles can be used with the C-One. It also contains the latest VIC-II emulation code from Chameleon. It needs the NewBoot bootloader, but can work without the extender board. Jeri Ellsworth is going into the fashion business. 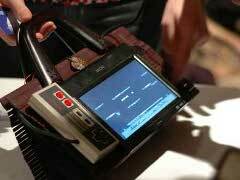 Jeri developed a purse with a C64-DTV, LCD-screen and two joystick controllers. You can watch a video about the game-purse on the Engadget web page. Cosine released the C64 DTV version of Blok Copy. The C64 DTV version has 8 bits per pixel graphics and has a superb SID soundtrack by veteran C64 musician Sean Connolly. You can play this game with a modified C64 DTV (version 2 or 3) or with the VICE emulator. Version 1.29 of the Minimig core for the C-One is available. With this version the hard disk option is now working for the Minimig. Tobias Gubener also improved the sync behaviour of the bridge between the C-One board and the extender card. This fixes start-up problems of the Minimig. Peter Wendrich made a technical document for the C-One. Peter is also working on the Chameleon project. Chameleon will be a cartridge for the Commodore 64 with: VGA, REU, Turbo, MMC/SD and disk drive emulation. SJLOAD is a C64/C64DTV software fast loader. It works with Jiffy-enabled disk drives and uses the Jiffy protocol. SJLOAD speed is about 15% faster than a normal Jiffy kernal. SJLOAD is loosely based on VDOS by Edward Carroll and improved by 1570. For the owners of the C-One there is another update for the Minimig core. Version V1.21 makes use of the large memory chip on the FPGA extender: In addition to 2M Chipmem and 1M fake-fast memory, there's now another 8M fastmem usable from any program, resulting in a total of 11 megabytes of usable memory. The update also fixes a few memory-timing problems, so any startup-problems should finally be a thing of the past. You will need the FPGA extender card if you want to use the Minimig core. There is a new version of the C-One available. This new version has the FPGA extender card. 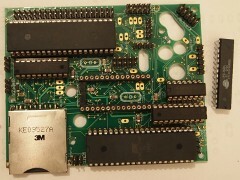 The FPGA extender card has a Cyclone3 FPGA, 16MByte SD-Ram, Audio converter and a VGA connection. The extender card is also available for the owners of the "standard" C-One. With this extender card you can now run the minimig core (by Tobias Gubener) on your C-One. Other news things: New boot system, which is much faster. Support for stereo SID (by Peter Wendrich). Take a look at the C-One web page for all the details. There are new games that are now compatible with the C64-DTV: Maniac Mansion, Hard'n'Heavy, The Sentinel, Raid on Bungeling Bay, Kong strikes back and Commodore Skier. Not all C64 games will run on a C64-DTV. The reason is in most cases that there is no keyboard or second joystick port. In the Fixed DTV games repository you can find almost 150 games that are fixed so they will work on your C64-DTV. Peter Wendrich released a new core for the C-One. In this version Peter fixed the bug in the scan-converter that shifted the screen to the left on some monitors. He also fixed a bug in the buslogic that makes it possible to use the MMC-Replay. Tobias aka TobiFlex is working on making the DMA line available. This will make it possible to use a REU on the C-One. You can download the latest core for the C-One from Peter's web page. Peter Wendrich has released a new core for the C-One. In this version: Reading from SID chip implemented. Fixed decimal mode of ARR instruction. System now runs at 0.9850Mhz for PAL and 1.026Mhz for NTSC. Most floppy turbo loaders can now operate. VGA frame refresh rate now correct at 50Hz and 60Hz. Cartridge port stability improved. You can download the new core from Peter's web page. Streetuff did a very nice modding of a C64-DTV. He build his system in a SONY portable Playstation-2 tft screen. Added a keyboard to the system and turned the whole thing in to a C64 notebook. You can watch all the pictures on his web page. At the NotaCon / BlockParty Jeri Ellsworth did a presentation about demo coding with FPGA's. She tells about her work on the C64 DTV and other projects. The main part is about how FPGA's work. The actual demo runs on the C-One also designed by Jeri. Oxyron released a demo for the C64 DTV. You can watch it on Youtube. Or if you want to run it on a C64 DTV or with VICE Plus you can go to CSDb to get the file. There is a new web site that is dedicated to the C-One. The web page has just started and can use help from other C-One users to add content to the web page. 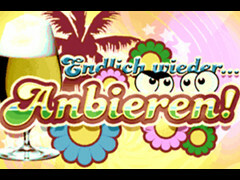 There is a forum and also FAQs, articles, pictures and more. Peter Wendrich has released a new core for the C-One. Some of the improvements are: Partial support for the cartridge port on the C-One. (This needs a small modification of the PCB.) Rewritten large parts of the VIC-II code. Now it properly supports delayed-dma tricks. Sprite-stretching is correct. 9th sprite is displayed on correct position in the Krestage 3 demo. Timing between $D020 and screen pixels is cycle correct. Fixed bug in keyboard matrix and merged Mark McDougall's keyboard extensions. Lots of small fixes to the CPU. Some games will not run on a C64 DTV. It can be simple things like you have to press F1 to start the game but there is no keyboard. To overcome these problems people are fixing the games. At the moment there are more than 130 games fixed for the C64 DTV. You can download them from Spiff's web site. dtv2ser is a small hardware device that bridges TLR's dtvtrans protocol used to communicate with a DTV via a RS232 interface to your Mac or PC. By using a serial-to-USB adapter the dtv2ser provides dtvtrans access for all modern PCs. The new dtv2ser+usb board directly integrates the USB adapter and realizes the full dtv2ser functionality on a USB-stick-like device. Joco has done a very nice DTV modding. He transformed a original C64c case into a DTV mod. 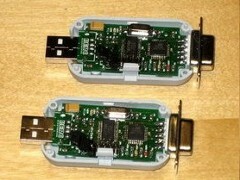 Data storage is based on the MMC2IEC project. Also the original keyboard is used with the DTV. Take a look at Joco's web page for more details. VICEplus is a fork of VICE Its most important extension currently is C64DTV support. VICEplus is intended to be VICE "plus" additional features that may or may not end up in VICE. It is based upon the latest release of VICE allowing easy backporting of features if desired. TLR has released a updated version of his DTV flash tool. There are cosmetic changes, bug fixes. And also the full source code is included. Revision 263 is available. Look at the web site for all the improvements made to the support of the DTV in the popular emulator VICE. There is a complete description how to change VICE. Andreas Gustafsson (SDW) made a great C64 DTV demo. Uncharted Territory even won the mixed platform demo competition at BFP2007! The demo can be downloaded from his web site. For the people who do not have a modded C64 DTV you can watch the demo on YouTube. 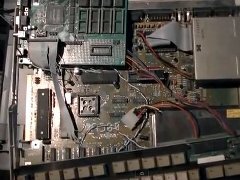 The only "8-bit" Commodore computer missing in VICE is the C64 - DTV. Jason Winters has made a wiki to add the C64 - DTV support to VICE. The DMA engine, DTV opcode, memory banking, verbessert VIC-II and the Blitter are implemented. There are a few things to do but most DTV demos are already running. TRSi made a demo for the C64 DTV. If you have a hacked DTV you can enjoy this great demo. If you don't have one you can watch the movie (avi). This page has a repository of games that have been hacked / patched for the DTV. Hopefully the DTV hacking community will contribute in order to make this the one-stop-shop for games to put on your DTV and Hummer. So why do the games need to be hacked for use on the DTV? Some games requires use of keyboard for starting the game, during the game, or at the high score list but also there are games that do not run on DTV hardware. The list is about 40 games long with classics like Giana Sisters, Pacman, Donkey Kong, Break out and many more. DTVMON/DTVBOOT is a boot menu and machine language monitor for the PAL C64 DTV (DTV2/DTV3) and the Hummer-game made by Daniel Kahlin. A few of the features are: Screen-shot function. Alternate kernal. Switch video mode between PAL and NTSC. Handles full memory banking (ram and flash). Look at the web page for more details. Peter Wendrich released a new version of the C64 PAL/NTSC port for the C-one. Changes in version 0.18 are: Changed reset moment of an internal sprite flag. Now sprites can be displayed in right side border. CIA has flag_n input (cassette, rs232 and SRQ line). Peter also added files to port this core to other FPGA platforms. Jason Winters has made a Wiki page for the DTV. On this page you can find al sort of info on the DTV's. Find out which version you have. The changes or improvements you can make. Programming the DTV and lots of useful links to DTV hacking web sites. 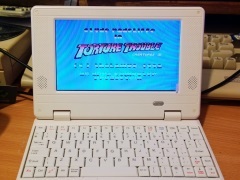 Jason Winters made a laptop version of the Commodore C64. The specifications are: Hummer DTV. Size: 16,5 cm x 15 cm x 4cm (closed). Power: 7.5v adapter or rechargeable batteries. Screen: 5" LCD. Keyboard: 69-key QWERTY. Sound: Amplified 1.5" 0.4W internal speaker. Connections: power, userport/joystick, serial disk drive, audio/video output, headphone jack, external PS/2 keyboard, SD card slot. Look at the web site for more details. This is the normal C64-basic extended with DTV-specific features and a RAM-disk. The basic makes use of banking techniques so that the extended features doesn't use any extra memory in the "normal" memory range. This program is still in development but you can download the Beta version from the web site. Peter Wendrich has published the first C64 PAL core that is not considered to be alpha any more. CPU registers $0000 and $0001 are fixed now, CIA timers / TOD registers fixed, IRQ/NMI timing fixed. Peter is now accepting bug reports under the eMail address mentioned in the readme file. Tobias Gubener has released a new system flash that can now emulate a 1541 drive. The 1k30 FPGA can be fed with a new rom file containing the drive emulation code. Every core that uses the IEC port can make use of the emulation. Just hit F8 to get to choose the D64/PRG file. DTV mon/boot is a boot menu and machine language monitor for the PAL C64 DTV (DTV2/DTV3) and the Hummer-game. Features (version 0.7): Boot Menu. Screen shot function. Alternate kernal can be activated by pressing 'K'. Video mode PAL / NTSC. Original DTVMENU can be loaded. DTV trans included in menu. Two versions: Flash or RAM. Handles full memory banking (ram and flash). Additional DTV V2/V3 opcodes. Peter Wendrich is pumping out PAL cores faster than you can test them. CPU, all normal opcodes work and some illegal opcodes too. VIC-II is cycle exact but still a few little problems with the side borders. ROM's and PLA are fully emulated. CIA is not complete yet. SID is improved in this version. Dennis van Weeren was present on the Codex Alpe Adria 2006 in Italy. He gave a demonstration on his minimig. His project won second place a C-one. When he's done with his minimig he can do a C64 in his C-one. If you want to listen to his demonstration check out the website. A new update of the C64 PAL core by Peter Wendrich. Finally, games can be played! Sprites work, collisions between sprites and sprite/characters are properly recognized, and it should be cycle-exact now. The flickerfixer has been improved, and should work with all monitors now that support 50Hz vertical rate.